It's twelve months since Amy Dombroski was tragically killed, whilst training, just days after arriving in Belgium to start her European season. Today she will be remembered across the world. A YEAR ago today Amy Dombroski died in a road accident whilst training in Belgium. The popular young American had just arrived back in Europe after starting her season in the States. The news of the 26-year-old's accident shook the cyclocross world. 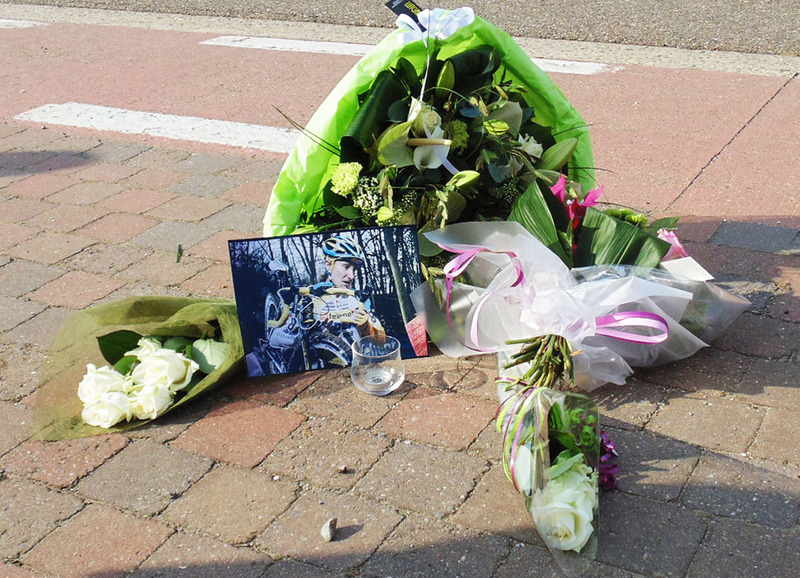 Amy’s Young Telenet-Fidea team mates were among those who paid tributes this morning on social media. This afternoon (October 3rd) Amy’s adopted home of Belgium will remember her at a memorial in Betekom followed by an event at the Kafee 't Hoekske in Heist-op-den-Berg which had been planned to be the base for her Supporters Club (the flowers below were laid at the memorial event today by YTFCT manager Kris Wouters. photo courtesy of: Alfons Volckaerts). The memorial day will also appropriately be a historic one for women’s cyclocross in Belgium. Ellen van Loy, who joined Telenet-Fidea last season, will now become the first woman 'cross racer (to most people's knowledge) to establish a café-based Supporters Club (at the 't Hoekske café in Heist-op-den-Berg). Telenet-Fidea team mate Nikki Harris wins an emotional Trofee race at Ronse just days after Amy's death and signals her tribute with a A-shaped gesture on the finish line. The team wore casquettes with "We ride for Amy" printed on the underside of the peaks. Poignantly, American National silver medallist Elle Anderson arrived in Belgium this week from California to race the winter for the Kalas-NNOF team. She will benefit from the experience of the team that also helped Amy whilst she raced in Belgium. “I will be hosted by the same family and team, that supported Amy. This is incredibly meaningful to me, as Amy and I attended the same ski academy in Vermont while we were in high school, and were only one year apart. Amy's journey from ski racing to racing cyclocross in Europe inspired me during my similar journey, and continues to inspire me today,” Elle told Cyclocrossrider.com in the summer. With a string of good results behind her last winter – 3rd in Diegem, 6th in Baal, 15th in the Worlds and, of course, second to Katie Compton in the US Nationals – we are going to see a lot more of Elle Anderson. Amy Dombroski’s memory certainly lives on in the cyclocross world. Above: Amy battling hard, as usual, in Ruddervoorde in 2012. That season she finished 11th in the World Championship.